Both body and mind can suffer from junk food effects. Diabetes, heart disease, obesity, depression, and mental decline can result from the wrong choices. Junk food effects can be serious, ranging from an increased risk for obesity and certain types of cancer to osteoporosis and cardiovascular disease, among other conditions. And don't be fooled by so-called "fake junk foods," such as pasta, desserts, and snacks made from vegetables; they may cause us to overeat, according to Kathleen Keller, a professor of nutritional sciences and food science at Penn State University. 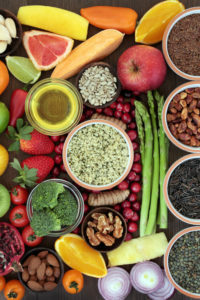 Whether your goal is to lose weight or to improve your health as a result of a diabetes or heart disease diagnosis, you must begin with your diet. For complete nutrition, make sure your meal plan includes plenty of vegetables, fruit, lean protein, and whole grains. Unfortunately, however, we often crave the wrong foods. While an occasional treat is fair, the following six junk foods and beverages should not be a part of your regular diet. Junk food effects can include increased risk for obesity, certain types of cancer, osteoporosis, cardiovascular disease, chronic inflammation, and other serious conditions. Keeping the following unhealthy items out of your diet is an important step in your overall health and well-being. If the high amount of sugar found in most regular sodas isn’t enough to keep you away, then you should know that drinking soda is linked to at least seven serious diseases, including liver, kidney, and heart disease as well as stroke and diabetes. And diet soda isn’t much better—studies show that consuming artificial sweeteners can increase glucose levels and alter gut bacteria in humans. Water, unsweetened tea or coffee, low-fat or fat-free milk, and small amounts of 100-percent fruit juice are all healthy thirst-quenchers. Added sugar is the main culprit in packaged cookies, but what’s even more concerning is the presence of trans fats. Trans fats can cause such serious junk food effects as cancer, infertility, and cognitive disorders. And cookies are just the tip of the iceberg. Processed pastries, cakes, brownies, ice cream bars, and quick bread mixes are still some of the worst offenders—and can be hard to resist despite our heightened awareness of trans fats dangers. Instead, look for treats that are labeled “trans-fat free”—or bake them at home, from scratch, so that you can control the amount of sugar and calories they contain as well as the type of fat used. They’re a popular way to hydrate and energize before, during, or after playing sports, but energy drinks can do more harm than good. They contain a potentially dangerous of amount of sugar, carbohydrates, and caffeine, which can cause heart palpitations, dehydration, headaches, insomnia, and high blood pressure. Studies also show that the amount of acid found in some energy drinks can be harmful to bone, muscle and brain health. A cup or two of coffee can give you a safe energy boost, while coconut water is a good choice for rehydrating after a workout. 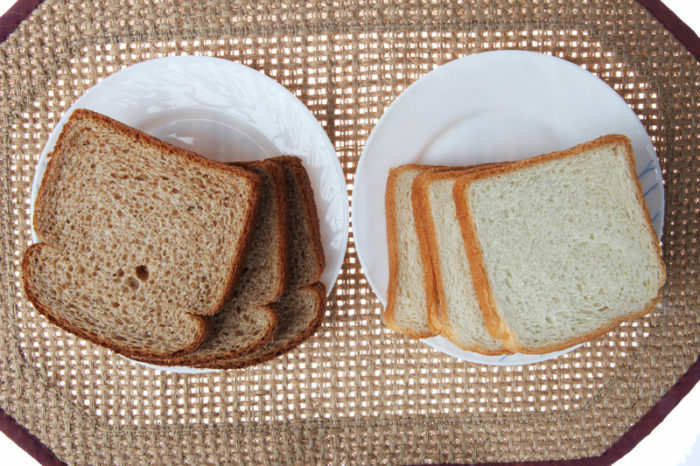 When slapping together that lunch-time sandwich, choose wheat over white bread to gain fiber and avoid processed flours and accompanying spikes in blood sugar levels. It makes a great-tasting sandwich, but white bread offers little beyond that. It doesn’t contain many nutrients, and because it’s made from highly processed flour, it can lead to quick spikes and drops in blood sugar, according to a study published in the American Journal of Clinical Nutrition. 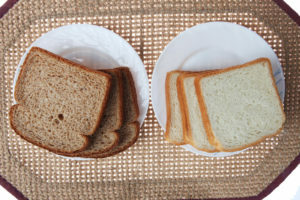 Switch to whole-grain bread, which is a better source of fiber and essential vitamins and can keep your blood sugar and insulin levels steady. Fruit drinks contain more sugar than the actual fruit they’re (partially) made from. Most contain large amounts of high fructose corn syrup, which can increase your risk of type 2 diabetes. If you want to consume a beverage with fruity flavor, make sure it’s a small serving of 100-percent fruit juice. Better yet, just eat a piece of fresh fruit. Otherwise, water is your best bet. As the old ad campaign told us, “No one can just eat one.” So don’t get started on that bag of chips…. 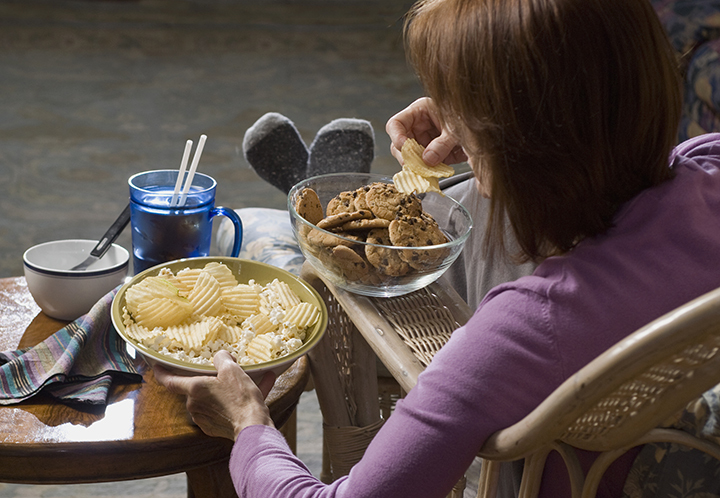 While some junk food can be enjoyed in small amounts, we know we can’t eat just one chip. As such, it’s best to steer clear. Some packaged chips and other salty snacks contain a significant amount of trans fats, plus they’re often packed with too much saturated fat, salt, and sugar. 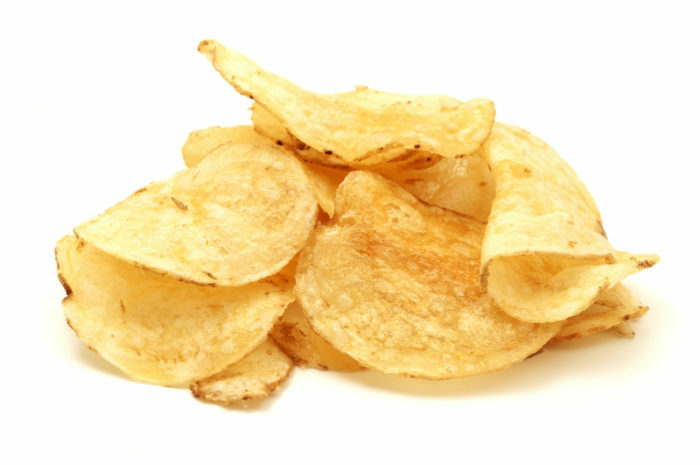 Plus, certain reduced-fat varieties of potato chips and similar snacks are known to contain trans fats as well. Instead, try carrots and celery sticks with hummus or air-popped popcorn for a healthy but still satisfying snack. Have you experienced junk food effects that surprised you? What are your favorite healthy snack alternatives? Share your thoughts in the comments section below. Top 5 Food Cravings: What Are They and What Do They Mean? 2 diabetes, artificial sweeteners, bacteria, blood pressure, blood sugar, blood sugar levels, bone, brain, brain health, caffeine, calories, cancer, cardiovascular, cardiovascular disease, carrots, chronic inflammation, coffee, complete nutrition, corn, corn syrup, dangers, dehydration, diabetes, diabetes and diet, diet, diet soda, energy boost, energy drinks, fast food, fast food and obesity, fiber, food, food cravings, glucose, glucose levels, gut bacteria, headaches, health, heart disease, heart disease diagnosis, high blood pressure, high blood pressure studies, high fructose corn syrup, infertility, inflammation, insomnia 2, insulin, is it bad to eat at night, junk food effects, Lose Weight, milk, most filling foods, muscle, nutrients, nutrition, obesity, osteoporosis, processed foods, protein, stroke, studies show, sugar, sugar levels, trans fat, type 2 diabetes, types of cancer, vegetables, vitamins, whole grain, whole grain bread, whole grains. There are exceptions to your generalizations. For example, there are some packaged cookies made with vegetable oils such as canola that don’t contain unhealthy fats, though virtually all contain surgar. SodaPop is part of what makes life worth living. It may kill me, but it will have been well worth it! Site too complicated for me to use. Password never works & tried to fix it….no help so deleted. I am disappointed. Contrary to the misinformation here, neither regular nor diet soda is driving complex health conditions, such as stroke, heart disease, diabetes or adverse brain health. Studies do not prove these bold conclusions, nor do they overturn the vast body of science that establishes the safety of these products and their ingredients. With respect to energy drinks, it’s important to point out that most mainstream varieties actually have far less caffeine than a similar size coffeehouse coffee. In fact, many have about half as much. Moreover, the FDA, European Food Safety Authority, and others have affirmed the safety of energy drinks and their ingredients. Bottom line: regulatory agencies around the globe verify the safety of soft drinks and energy drinks. These products come in a wide array of calorie counts and sizes and can be incorporated into a balanced lifestyle. I knew a guy that drank a six pack of Pepsi per day, most of it at work; one day he collapsed and was in hospital for a week. Drs. declared that the culprit was the large amount of sugar in one day. I had digestive problems for a long time, before a Dr. told me to stop diet sodas to see if that would help. I did and two days later, the problems stopped. All those with the large sodas all the time will soon have no teeth. Sodas destroy teeth. You can use coke on your car battery to dissolve the crud that collects. That should tell you something. My sister-in-law drank a lot of cokes every day and dissolved her crowns and bridges. If I have anything with sugar in it, I get stomach aches. I just don’t feel well. I can’t tell you the last time I ate fast, processed foods and rarely have soda. I prefer good cheese, oat bread and fruits. Rarely have beef, either. Prefer fish and chicken, eggs and whole grain cereals. I love hibiscus tea, water, milk and real juice. I subscribed to what I thought was a helpful and interesting site only to be overwhelmed by the onslaught of email. And what’s with the publications that have several ads? Plus I find a good bit of your information is outdated. Unsubscribe me please.